As expected, Moon Jae-in was voted in on May 9 as the next President of South Korea with 41.1% (13,423,800) of the vote. Hong Jun-pyo came in a distant second at 24% (7,852,849). The final outcome was very close to the 17%p margin predicted by the exit poll released around 8pm local time. The turnout was at 77.2%, higher than that of the last three presidential elections. This can be explained by a combination of factors. Higher voter interest was paramount, but the fact that voters had more choices for candidates in this election also mattered. In addition, voting areas stayed open for two hours longer than in the past. There were at least three surprises in the outcome. 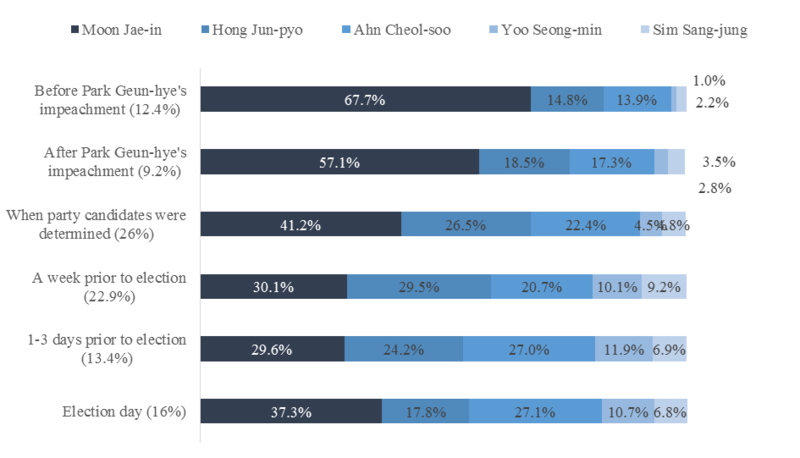 First, Yoo Seong-min (6.8%) finished with higher percentage of votes than Sim Sang-jung (6.2%). Relative to Sim, most of the voters who supported Yoo appear to have made their decision during the final week before the election. The second unexpected outcome was Ahn Cheol-soo’s performance in the Jeolla province. Ahn fared poorly in this region with only about 26~27% of the votes despite the People’s Party (PP) gaining wide support in this region in the general election last year. This shows that Moon Jae-in and the Together Democratic Party (TDP) have regained the lost ground in the Jeolla region. The PP may want to rethink whether its association with Ahn is a liability. Finally, many pundits questioned whether South Korean voters during this election would be motivated to vote strategically. Exit polls suggest that nearly 83% of the voters casted their ballot for the candidate who they most preferred, and little over 17% voted for a candidate in order to prevent a less preferred candidate from becoming a winner in this election. In short, most voters voted genuinely. Let’s delve more deeply into the exit poll data collected by KBS, MBC, and SBS in order to get a sense of the motivations behind South Korean voters’ choices. As expected, more than half of the conservative votes went to Hong while 64.5% of the progressive votes went to Moon. Despite being a conservative candidate, Yoo received only 7.8% of the conservative votes. Although he performed well during the nationally televised debates, results showed that his image among the conservatives as a “turncoat” was too much to overcome. A crucial difference between Moon and Hong came from the moderates, who made up over 41% of the total votes, with 41.5% voting for Moon and only 16.1% voting for Hong. Also, more moderate votes went to Ahn than Hong. If Ahn had fallen out of the race, these votes could have shifted towards Hong and made the race tighter. The loyalty of Moon’s support base also contributed to this election outcome. He retained many of his voters from the last presidential election. 74.2% of voters who voted for Moon in the 18th presidential election also voted for him on May 9, which is approximately 27% of the voters from the last election. 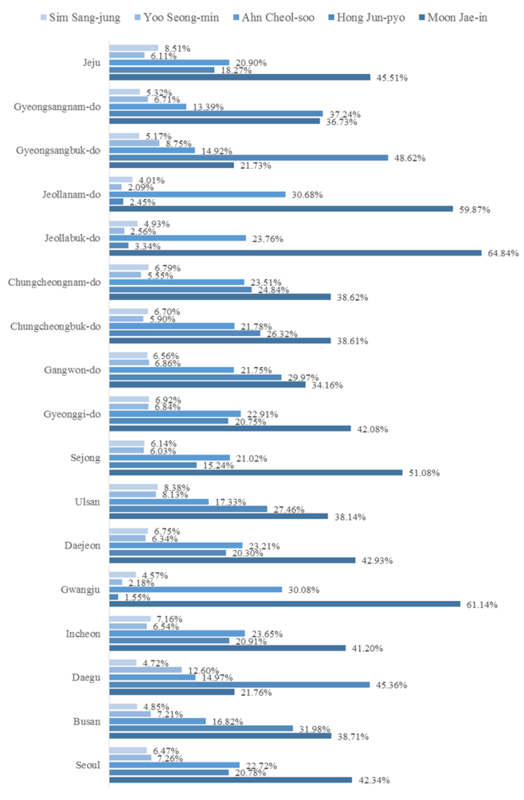 On the other hand, almost half of Park Geun-hye’s supporters voted for Hong (~21%), followed by Ahn, Moon, and Yoo. Once again, Yoo failed to gain the conservative votes, even trailing behind Moon by a significant margin. Note also that those who did not vote in the last election leaned mostly towards Moon and Ahn. We can see that there is a relationship between partisan leanings and the choice for president. For example, 76.1% of those who voted for the Together Democratic Party during the last general election also voted for Moon, while 57.2% of Saenuri voters chose Hong. Moon also received more than half of the votes from the Justice Party voters. Similarly to Moon and Hong, Ahn received the majority of votes from supporters of the People’s Party. Yoo, who at the time of the last general election was an independent, received most of his votes from those who did not support the four major parties or participate in the last general election. One of the most interesting answers from the voters came when they were asked about the timing of their choice for a specific candidate. The most staggering statistic is that over 29% of the surveyed voters did not make their decision until three days before the election. 16% made their decision on the day of the election and nearly 50% of the surveyed respondents stated that they made their decision in the last week of the election. Given the loyal following that Moon maintained in this election, perhaps it is not that surprising that more than half of all early deciders supported Moon. Among those who made up their minds before the impeachment of President Park, a surprisingly high number (67.7%) supported Moon. Support for Moon also continued after the impeachment and after the candidates were announced. Hong’s support seems to have developed from the announcement of his candidacy until the week before the election. This suggests that his performance during the nationally televised debates and his campaign efforts were effective in drawing support from voters. There is evidence to suggest that voter choice was motivated by their views on the impeachment. 70% of those individuals who opposed President Park’s impeachment voted for Hong. 82% of those voters who supported the impeachment voted for Moon, Ahn, or Sim (Figure 5). Moon’s supporters were also very concerned about President Park’s conduct during the Sewol Ferry disaster, Choi Soon-sil’s involvement in decision-making, and Park’s governing style (Figure 6). Finally, those who oppose granting amnesty for former President Park tended to favor Moon, Ahn, and Sim while those who support granting her amnesty were more likely to support Hong (Figure 8). On the question of policy, nearly 65% of the surveyed voters stated that they cared most deeply about jobs, social welfare, and the economy. 13.5% cared about political reform. 22% cared about national security and foreign policy. Voters who placed greater importance on issues related to the economy and political reform tended to favor Moon while those that cared more deeply about foreign policy and national security issues favored the conservative and moderate candidates (Figure 8). Overall, more than 89% of the voters favored increasing taxes in order to increase social spending or maintaining the current level of social spending and taxation (Figure 9). Those who support a more expansionary fiscal policy leaned towards the more progressive Moon and Sim. Those who favored a more orthodox fiscal policy supported Hong and Yoo. 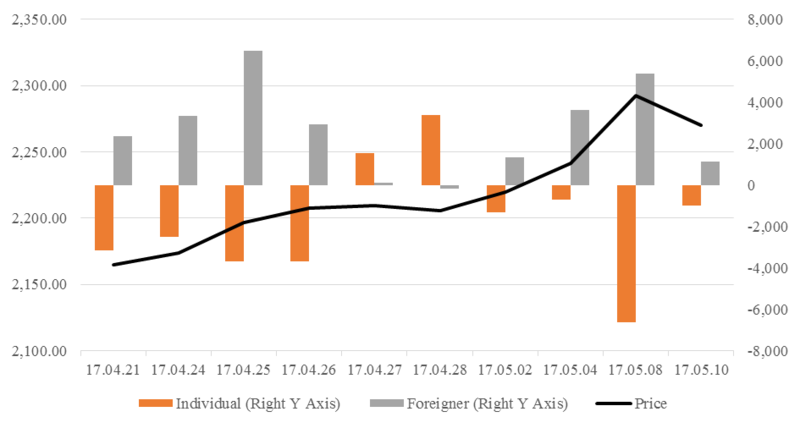 Support for Ahn was split evenly among those that support both expansionary and orthodox fiscal policies. Finally, on the question of THAAD and national security, nearly 60% of the surveyed voters supported the THAAD deployment on the Korean Peninsula. More than 60% of those who disagreed with the THAAD deployment broke for Moon while there was a more equitable distribution of THAAD supporters among Moon, Hong, and Ahn. But most THAAD supporters tended to lean towards Hong. The initial reaction by the public appeared positive, with sizable crowds turning out in Gwanghwamun square during the late evening hours to celebrate Moon’s victory. The market reaction, however, was somewhat mixed, with a strong opening before 11:00am local time, but the mood changed quickly in the afternoon as the KOSPI fell by about 22 points from a previous high on May 8.